PHP 7.2 was officially released as of November 30, and it is tested and available immediately on all Surfside Web hosting servers. The release has new features, functions, and improvements that allow you to write better code. What Does PHP 7.2 Mean for WordPress Site Owners? 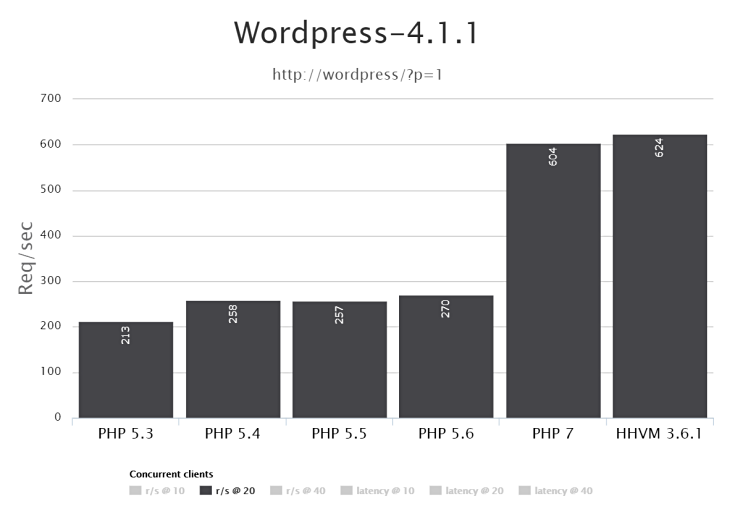 According to the official WordPress Stats page, only 17% of WordPress users have upgraded to PHP 7, only 7.2% use 7.1 and only 0.6% are using PHP 7.2 like us. 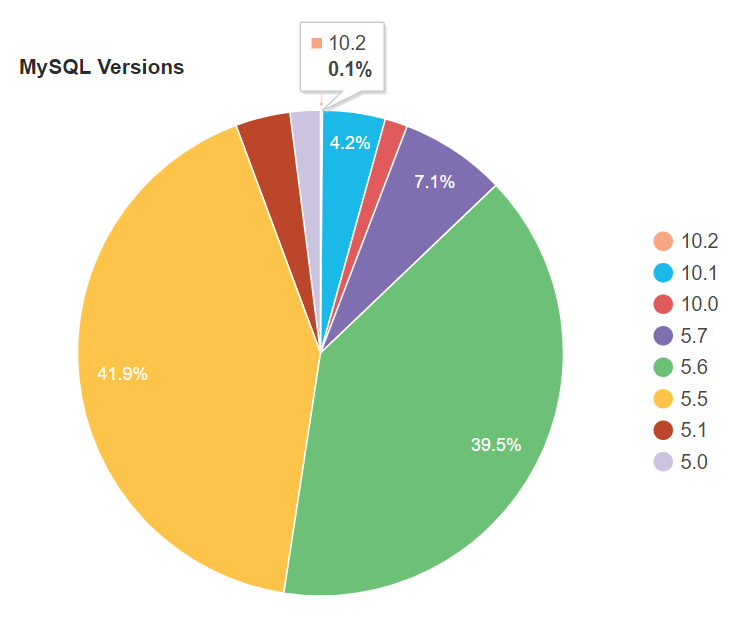 You can see that a large majority of users, over 40%, are still running on PHP 5.6. 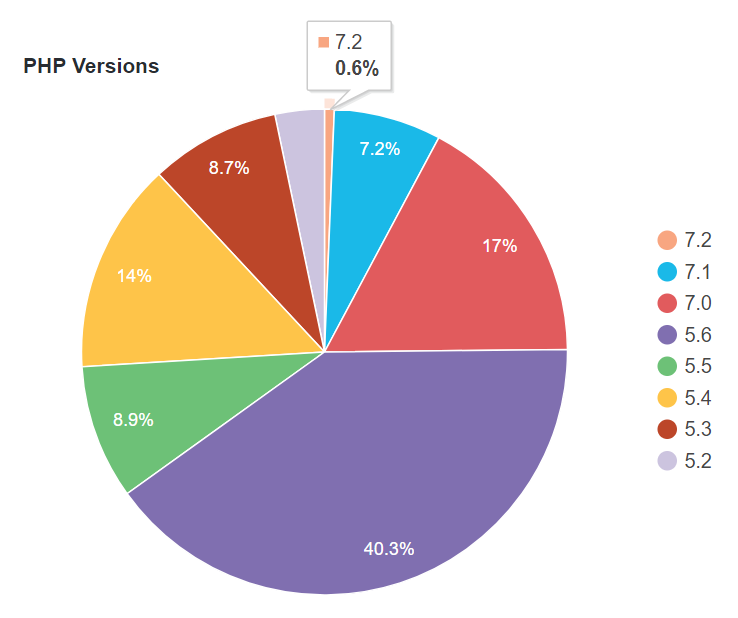 Even scarier is that over 34% of users are using unsupported and vulnerable PHP versions. Upgrading your WordPress to 7.2 seems pretty safe to date. We would suggest going through your plugins though and verify that they have been updated. If you click on the details link for the plugin and see the words, "this plugin has not been tested with the last few versions of WordPress", you may want to look into upgrading that plugin. You can go to the original website to see if maybe there is an update available, or you can create a Support Ticket with us and we can look at the code base to see if there are any incompatibilities first. As of January 2018, WordPress.org actually bumped up their official recommendation to PHP 7.2, MariaDB 10.0 or better and Apache with SSL security. We recommend this too and that's what you can expect from Surfside Web hosting servers optimized for applications like WordPress and Woocommerce. Speaking of MySQL vs MariaDB; MariaDB shows a 10% increase in speed, 5-7% reduction in CPU utilization, with a 10% improvement in write latency over it's predecessor. This overall performance increase justifies our change to MariaDB in the summer of last year. It also explains the WordPress web hosting recommendation. The combination of PHP 7.2 and MariaDB 10.1 overall shows a HUGE improvement in technology for 2018. Benchmarks have been performed between the various platforms using WordPress and the results are extraordinary showing a 225% speed improvement over PHP 5.6 systems at 604 requests per second. How to implement PHP 7.2 in Your Surfside Web Hosting? Login to your hosting control panel. Scroll down to the Software menu group. Click on "Select PHP Version". There you will see your current PHP version as seen in the image here to the right. Select 7.2 from the pull down and click the "Set as current" button. That's it! If you need to adjust the libraries you have the access for that there too. Clicking on the "Switch to PHP options" link will show you your default options where you can access your memory, download size, etc. Enjoy! After changing PHP version immediately check your website, running though things page by page. Remember to login to the admin panel for your software because there can be issues there not seen on the front end. Normally if there is going to be an issue like an obsolete library or something, you will know on your first visit. If you have issues simply switch your version back to the version you were running and check your error_log files for the conflict reported. Changes that can be seen in PHP 7.2? Version 5.6 will continue to be the installed default, and will remain so probably until the end of 2018. Change is not required, only encouraged. There are many changes from 5.6 to 7.2. Mostly they are simple programming code changes. There is a lot of backwards compatibility in place so much of it won't even be noticed. However, many functions have deprecated and will be removed in PHP 8, but that's not going to be an issue for awhile. The great news is that there are many new features and changes that improve performance and the ability of your applications. Several of the features added were done so in order that PHP can compete with the common features of Java and C+. So if you are writing new applications we suggest you go over the migration guides below and start working with PHP 7.2. You'll see some great improvements right away.